"Taken Wednesday 15th December 2010. This is a photograph album given to my great great aunt by her uncle George Paterson. As you can see it is dated Glenbucket, 29th June 1888. It contains a lot of photographs of people I have not been able to identify. My gt gt Grandmother was Ann Farquharson of Belnaglack & the album was a gift to her Daughter, Margaret Murdoch was my gt gt gt G mother and she Married a Paterson later in life, never having married Anne's Father John Faquharson." "I recall a story my Grandfather told of delivering calves to Glenbuchet one Burns night with his business partner Willie Taylor. They had to wait till everything was finished and the bobbie helped push the cars out of the ditch ( imagine that happening now). Then they went round all the farms delivering. Willie got a dram at each fairm as my Grandfather was teetotal, that would have been at the back of the war." The picture may not be that of Isabella Anderson. If anyone can help identifying the lady please let me know. From clues provided below and an internet search it is posssible to piece together the family trees of the Addison and Paterson families. The Addison family tree from Queensland Family Trees. This leads to Isabella Anderson born 1857 who may be the person mentioned in the photo book above. Ann Farquharson in the parish of Glenbucket was proclaimed within the parish Church of Cairney once today and once on each of the two preceding Sundays and no objections were offered. MARR: CONC proclaimed were married in presence of Witnesses. This gives the family of George Paterson born 1834 and died 1898. 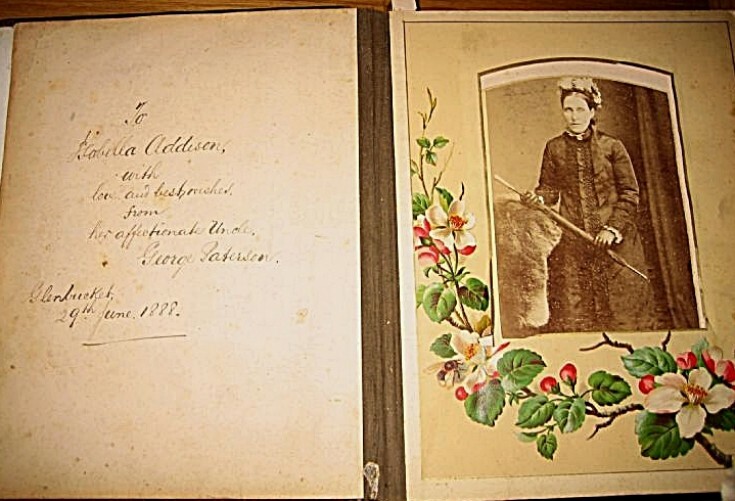 He is therefore related to Isabella Addison and could have written the introduction to the photo album in 1888. James, if you can scan or photograph the photos in the album and put them on this site,some of us may be able to identify the people. But its a long time ago! An Isabella Addison was born 1857 in Cairnie to John Addison & Ann Farquarson. Ann Farquarson was born in 1822 to John Farquharson & Margaret Murdoch (This is off an index - the full entry needs to be checked, but I am guessing an illegitimate birth). In 1833 Margaret married William Paterson & their son George was born in 1834. Probably the connection. The majority of the people mentioned here are all related to me from Margaret Murdoch , Ann Farquharson and marriages to Giles, Paterson and Addison. Alan Johnston is correct- Ann was illegitimate. I would like to know if the James Addison that submitted this info is available to contact.